Huawei’s second Android Go smartphone is here. The Huawei Y5 Lite offers lowly specs and an entry-level Android experience at a very attractive price. The Huawei Y5 Lite has a 5.45-inch IPS LCD of 1440x720px resolution, a rear-facing 8MP f/2.0 PDAF camera and a 5MP f/2.2 fixed-focus selfie camera. 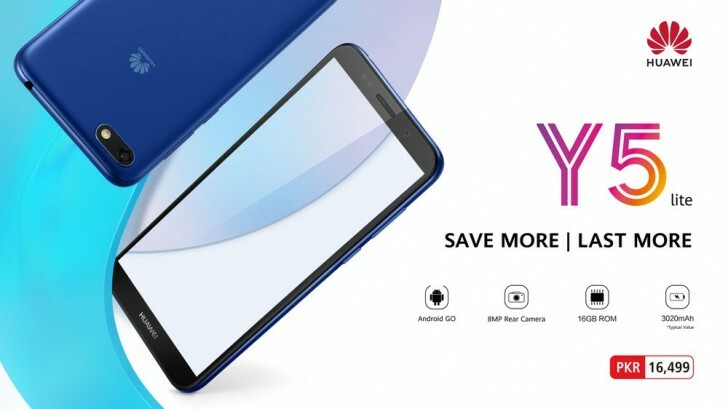 Huawei has equipped the Y5 Lite with 1GB of RAM, 16GB of expandable storage, a quad-core MediaTek MT6739 processor and a 3,020mAh battery with regular charging. Our only gripe with the Huawei Y5 Lite is the fact that it comes with Android 8.1 Oreo (Go Edition) and not Android 9 Pie (Go Edition). Users in Pakistan will be able to snag the Huawei Y5 Lite in Black or Blue for PKR 16,500 (around 100).